Haven’t your patience exhausted of going through those futile treatments for your leg pain? Statistics suggest that tens of millions of Americans are suffering from multiple pains. That is partly because, traditional treatments have failed to relieve many of those conditions. When conventional treatments are just partly effective or ineffectual for chronic pain, then interventional procedures may be taken into account. Lumbar sympathetic block is one of those minimally invasive interventional procedures. If you have a long-lasting untreated leg pain, which has not responded to the other conservative methods, then this approach is the treatment of your choice. 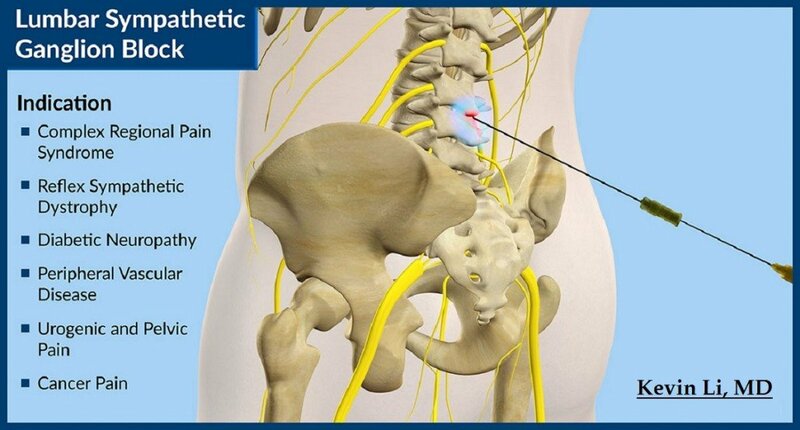 Therefore, if you have untreated lower back or leg pain related to these medical conditions, the lumbar sympathetic block injection is your choice of treatment. To perform this 30-minute treatment in a pain clinic, firstly, you are given some intravenous drugs in order to make you relaxed. Then you should lie prone on the X-ray table. The pain doctor will desensitize your lower back. Then, an X-ray guided needle will be introduced into your back along the outside of your spine column; a contrast is injected to the area to confirm the proper location. At that point, anesthetics (e.g. bupivacaine) are injected. You may immediately feel relieved, but just for a few hours of the anesthetics’ effects. If the procedure worked, the pain doctor may recommend a series of these blocks 2 weeks apart, which may give you more long term relief. In some cases a couple of injections are enough, but at times, there are over 10 shots needed. No serious complication has been reported following this procedure. You have other choices than living miserably with your old stubborn leg pain! Nowadays, you can enjoy the benefit of receiving professional expertise in pain care clinics, to leave your leg pain behind. Dr. Kevin Li, MD, is a spine doctor in Los Angeles. With the up-to-date interventional therapies presented in his pain clinic in Los Angeles, he is confident of creating a comprehensive treatment plan tailored to your lower back pain. Just contact his pain clinic in Los Angeles today at (626) 538-8950 to make an appointment. And breathe new life into your “new life”!